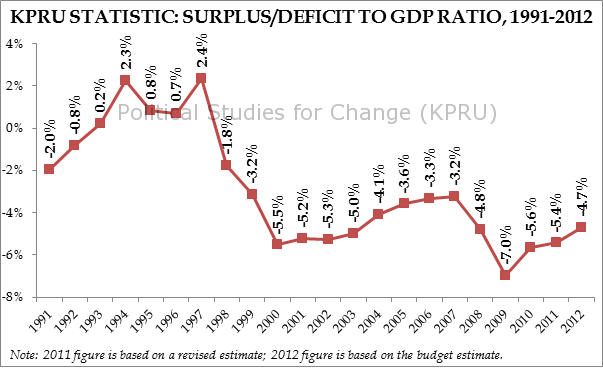 Fiscal deficit is not always bad. However, persistent fiscal deficits even when economy is growing – meaning there’s a serious lack of fiscal discipline – would weaken a government’s position to meet its debt obligation later on, especially in time of recession. And when this happens, that means the future generation will be burdened with ballooning public debt. Mathematically, drafting a national budget very much depends on a country’s economic growth projection over next year and thus its nominal value of Gross Domestic Product (GDP). A robust growth will mean higher GDP and higher revenue as tax and other revenues go up. That will provide a smaller value of budget deficit forecast and of course a smaller percentage of public debt. However, when economic growth projection is over-optimistic or when economy is slowing down, that will mean smaller-than-anticipated tax and other revenues, hence, the actual nominal value of GDP is smaller, driving the shortfall higher. That will provide a bigger value of budget deficit and thus a higher percentage of public debt. The world economy is on a downward spiral. As one of the most open economies and very dependent on international trade, various growth projection of Malaysia for next year is significantly lower despite Prime Minister Najib Razak’s over-optimistic growth forecast of 5.0 to 6.0 percent and budget deficit forecast of 4.7 percent for 2012 in his proposed RM232.833 billion Budget 2012 tabled on the 7th of October, 2012. Most research houses have lowered their 2012 growth projections for Malaysia despite Najib’s optimism in his 2012 Budget proposals, which critics have said is primed for the imminent 13th General Election. Against this background, the Malaysian Institute of Economic Research (MIER) downgrades 2011 GDP growth rate to 4.6 percent year-on-year. For 2012, MIER revises the GDP growth forecast to 5.0 percent. According to the RHB Research Institute, Malaysia’s economic growth could slow to just 3.6 percent next year from a projected 4.3 percent this year due to the increasing risk of a double dip global recession. Given the projections and path we are currently on, that means even higher deficits than we have now. Worse than the worst, if we go into a recession, we will see record-level deficits and public debts. By that time, as the government’s debt obligations are mathematically impossible to resolve, the rakyat will then wake up one morning to the reality that they are a lot poorer than they thought. According to the 2010 Auditor-General’s Report released on 24 October 2011, Malaysia’s public debt rose by 12.3 percent or RM44.72 billion to RM407.11 billion last year compared to RM362.39 billion in 2009. The Auditor-General said in the report that the government owed 53.1 percent of GDP, slightly down from 53.3 per cent last year. That’s the second consecutive year the Federal Government debt to GDP ratio surpassing the 50 percent level. By referring to the following chart provided in the 2010 Auditor-General’s Report, public debt from domestic sources rose by RM41.76 billion to RM390.36 billion while external debt rose to RM16.75 billion, up RM2.96 billion. Sources: 2010 Auditor General’s Report. It is in this context that I shall try to argue that, fiscal discipline and prudent debt management of the government of the day should be taken seriously as the most basic and important elements of good governance. 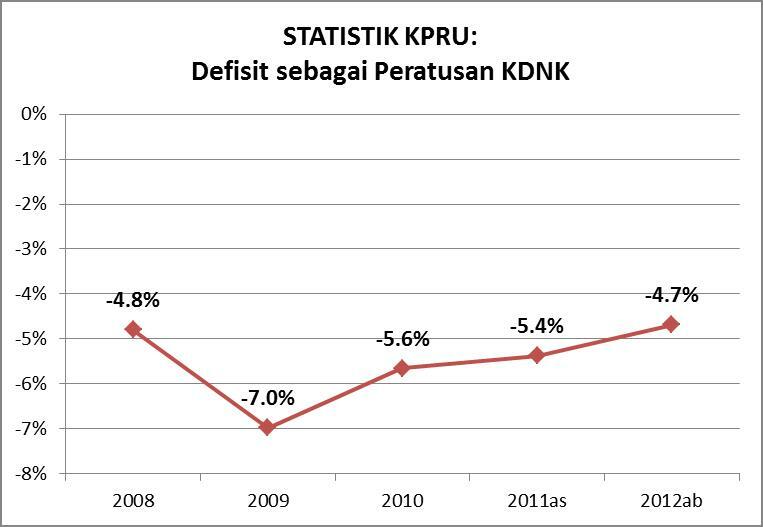 In the following chart, Federal Government deficits figure compiled by a local research institute as well as a political think tank Political Studies for Change (KPRU – Kajian Politik untuk Perubahan) has shown that, there’s a serious lack of fiscal discipline in the Federal Government under the administration of then Finance Minister Mahathir Mohamad, later Abdullah Ahmad Badawi and now Najib Razak. It is worth noting that the country has been in deficit for 14 consecutive years, and this is set to continue in 2012. This trend started in 1998 in the aftermath of the Asian financial crisis, which coincided with the sacking of Anwar, the Finance Minister and Deputy Prime Minister at that time. In fact, ever since Anwar was appointed Deputy Prime Minister in 1993, the country’s budget had been in surplus every year until his sacking. After being appointed Finance Minister in 1991, Anwar turned the budget deficit into surplus in two years’ time, which was no mean feat as the country’s account had been in deficit for more than 20 years before his helming of the treasury. A brief period of surplus was recorded and they were 0.2 percent in year 1993, 2.3 percent in year 1994, 0.8 percent in year 1995, 0.7 percent in year 1996 and 2.4 percent in year 1997. In contrast, current government under the administration of Najib has run on budget-deficits with increasing Federal Government debts. When one takes a deeper look into the numbers, one has to say that Anwar’s record as Finance Minister is indeed impressive. Total Federal Government debt actually decreased from 1992 until 1996 after more than 20 years of consecutive increases. 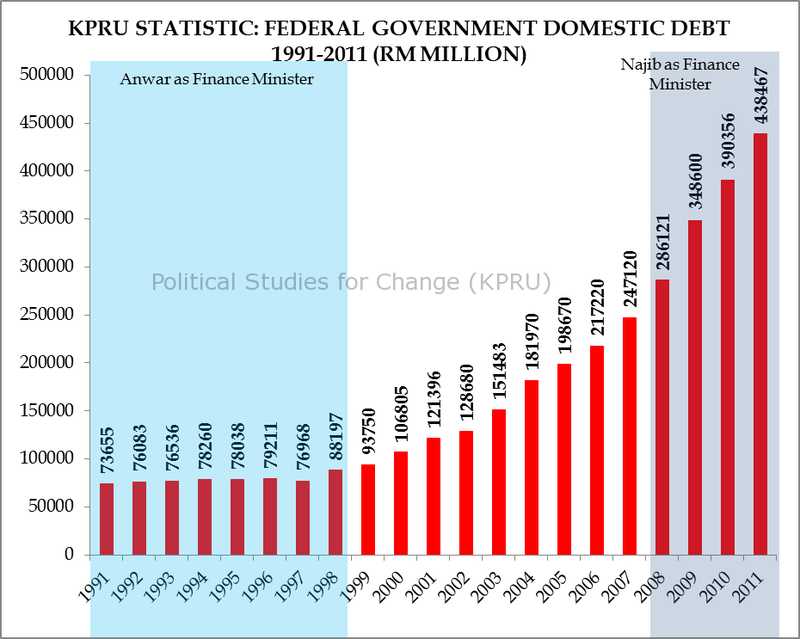 The total Federal Government debt level had also been kept between RM89 billion to RM100 billion from 1991 to 1997. 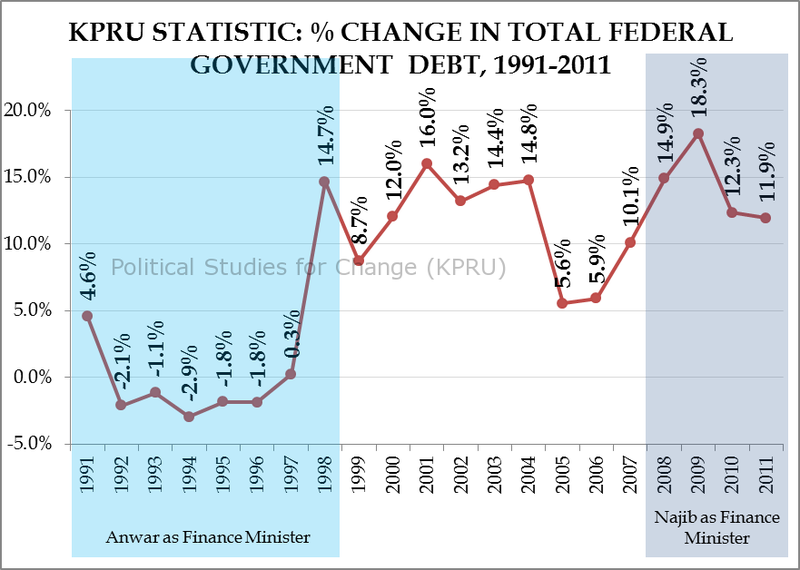 In the Anwar era, besides a 4.6 percent increase in Federal Government debt in his first year as Finance Minister, and a 0.3 percent surge and 14.7 percent surge in 1997 and 1998 respectively when the country was badly hit by the economic crisis, the debt level had been decreasing at a stable rate of 1 to 3 percent every year. In contrast, total Federal Government debt had been increasing rapidly at a rate of more than 10 percent every year since Najib became Finance Minister in 2008. To make things worse, the BN Government has a tendency to approve supplementary budgets in dealing with over-spending one after another, quite often without valid ground. The basic principle to table a supplementary supply bill is when unexpected expenditure takes place especially when a country is in a crisis like the earthquake and nuclear disaster in Japan. However, having been criticized for over-spending and persistent budget deficits, the BN Government has manipulated the supplementary budget as a political tool to hide escalating deficit and debt figures during annual announcement of the National Budget rather than as an avenue in dealing with unexpected spending. For example, in the latest Supplementary Supply (2011) Bill 2011 tabled in June this year, the Najib administration had been criticized for manipulating RM1 billion of allocation for emolument of Health Ministry as emolument shouldn’t fall under unexpected spending. That’s also one main reason why initial forecast of deficit figure announced during annual budget session used to be lower than the actual one. 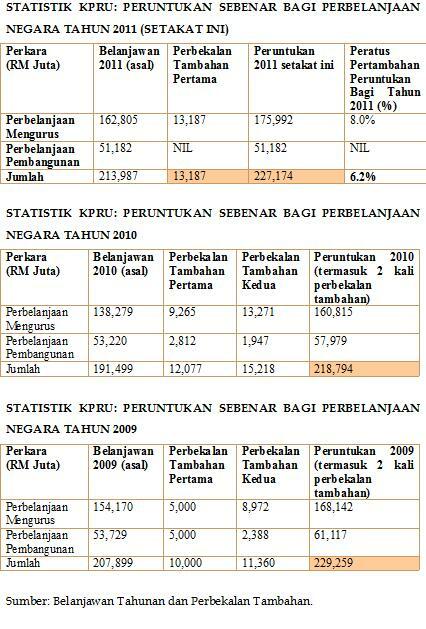 The following tables compiled by KPRU have shown that, the BN Government has tabled two supplementary supply bills outside the 2009 National Budget, another two supplementary supply bills outside the 2012 National Budget and up until today, one supplementary supply bill outside the 2011 National Budget. Although the 2012 National Budget has just been tabled, past records show that the BN Government could table another supplementary supply bill outside the 2011 National Budget during current parliament session or in year 2002. Source: Supply Bill and Supplementary Supply Bill. On the 7th of October, 2011, in a politically staged event of utmost importance to his own survival as well as UMNO-BN, Najib gave a positive prognosis of the Malaysian economy by proudly claiming a projected 5.0 to 5.5 percent growth rate for 2011, and then unrealistically projecting a 5.0 to 6.0 percent growth rate for 2012. On top of that, Najib also touted a reduction of the federal fiscal deficit to 4.7 percent of the GDP in 2012 from 5.4 percent in 2011. Missing from his speech was any mention of our national, external, or total Federal Government debt. In fact, the last time any of this was mentioned in a budget speech was two years ago in 2009, when Najib conceded that the rate of our national debt was getting higher and higher. 2009 was also the year in which the total Federal Government debt recorded a marked increase to 53.3 percent of the GDP from 41.3 percent the year before. The Federal Government debt to GDP ratio had maintained at rate of around 53 percent to 54 percent since then, with the 2011 figure projected at 53.8 percent. According to Bank Negara Malaysia’s latest report, as of 30 June 2011, Federal Government debt stood at RM437 billion, with domestic debt amounting to RM421 billion and foreign debt at RM16 billion. According to the 2010 Federal Government Financial Statements prepared by the Accountant General of Malaysia, for the year 2010, total Federal Government debt increased by 12 percent to RM407.101 billion as against RM362.386 billion in 2009. 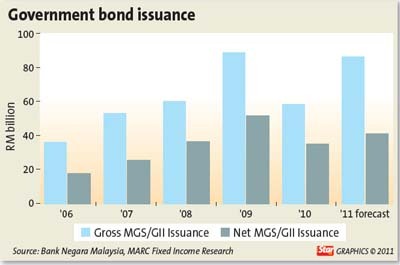 Borrowings increased by RM45.062 billion or 13 percent to RM399.711 billion from RM354.649 billion in 2009. Reacting to the latest debt figures, Parliamentary Opposition Leader Dato’ Seri Anwar Ibrahim warned that Malaysia was on course to breach the public debt limit due to the Federal Government’s failure to resuscitate the country’s under-performing economy. Based on the Government Funding Act 1983 and Loan (Local) Act 1959, currently, the ceiling under both Acts is not more than 55 percent of total GDP. In addition, external loans are obtained with limits of borrowing based on the External Loans Act 1963. Currently, the ceiling under the Act is RM35 billion. Viewing the situation from another perspective, we turn to the work of Carmen Reinhart and Ken Rogoff entitled ‘This Time Is Different: Eight Centuries of Financial Folly’. They studied the factors contributing to 29 past sovereign defaults and found that default or debt restructuring occurred, on average, when external debt reached 73 percent of Gross National Product (GNP). Note: 2011 figure is based on estimate. 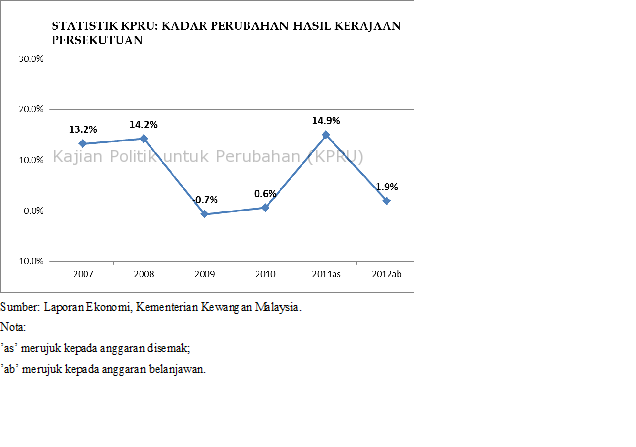 Source: EPU     (1991-2008), MOF Economic Report   (2009-2011). 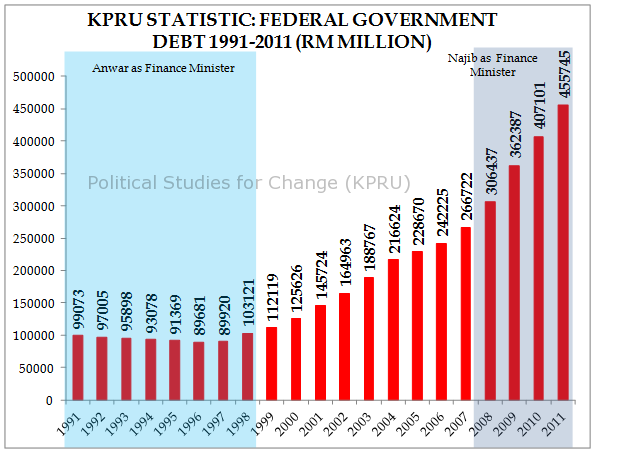 Based on the above chart compiled by KPRU, total Federal Government debt was RM99.073 billion in 1991, the year Anwar became Finance Minister. It dropped to RM97.005 billion in 1992, RM95.898 billion in 1993, RM93.078 billion in 1994, RM91.369 billion in 1995, and RM89.681 billion in 1996, before it rose minimally to RM89.920 billion in 1997, and more significantly to RM103.121 billion in 1998. Total Federal Government debt was RM306.437 billion in 2008 when Najib took over as Finance Minister. It rose to RM362.387 billion in 2009 and RM407.101 billion in 2010. 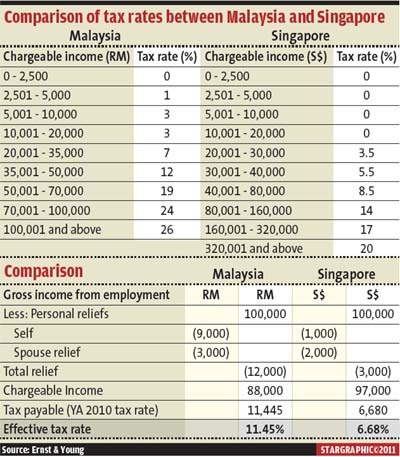 It was projected to hit RM455.745 billion in 2011. According to Bank Negara Malaysia’s latest report, as of 30 June 2011, Federal Government debt already hit RM437 billion. 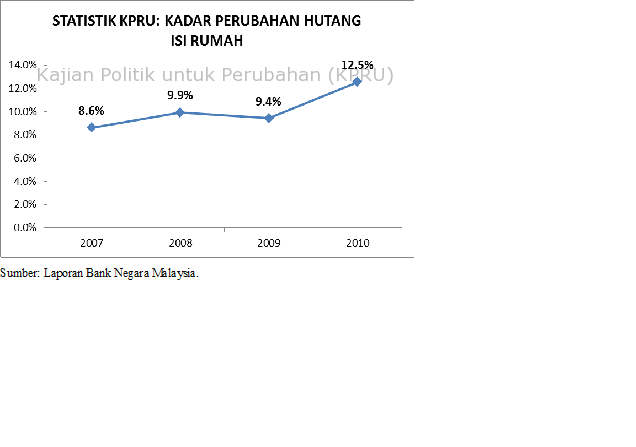 Source: EPU   (1991-2008), MOF Economic Report   (2009-2011). Based on the above chart compiled by KPRU, the reasonably well managed debt levels during Anwar’s time as Finance Minister can be attributed to sound management of the domestic debt. Anwar had managed to keep the domestic debt level below RM80 billion until 1997 until it hit RM88.197 billion in 1998. In the seven-year period from 1991 to 1998, domestic debt rose by a total of RM14.542 billion or 19.7 percent, with the bulk of it coming from the period of 1997 to 1998. 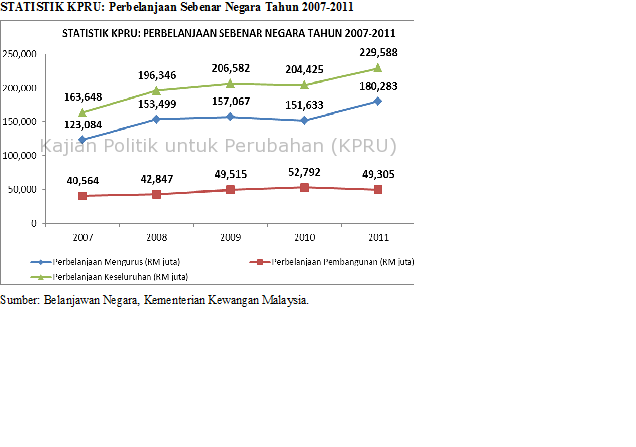 From 2008 to 2011, in a short span of three years, domestic debt rose by a total of RM152.346 billion or 53.2 percent. This shows that the domestic debt level rose sharply since Najib took over as Finance Minister until now. In fact, Najib’s debt management seems to be worse than his predecessor, Abdullah Ahmad Badawi’s. 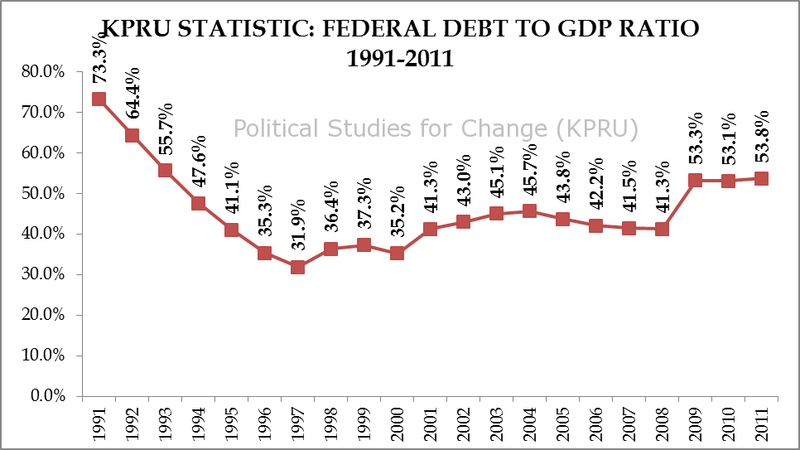 Based on the above chart compiled by KPRU, the total Federal Government debt grew 5.6 percent and 5.9 percent in 2005 and 2006 respectively, and they were the smallest since an 8.7 percent increase was recorded in 1999. 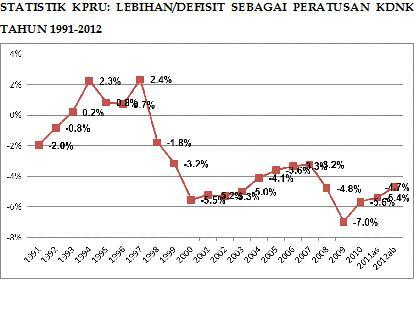 1991-2008: Calculation based on Federal Government debt and GDP figures from EPUt       (1991-2008). Based on the above chart compiled by KPRU, the period in which Anwar was at the helm of the Treasury also saw a remarkable decrease in the Federal Government debt to GDP ratio, from 73.3 percent in 1991 to 31.9 percent in 1997. In contrast, Najib’s helm of the same office was marked by an increase of more than 10% in the Federal Government debt to GDP ratio from 2008 to 2009. The numbers do show that Anwar is a more prudent and effective manager of the economy as compared to Najib. Najib can point to the weakness of the global economy time and time again, but the increase in spending, and more specifically, extravagant spending in the wrong areas and money-corrupted governance seems to be the reason for our continuing high debt level. How much public money has been lost through corruption? How much of it has been used to subsidise big corporations instead of the people? How much of it has been used to pay for ‘commission’ for big business deals involving the government? We may never know how much, but we do know that it is one hell of an amount. A corrupt governments’ moral or legal right to bind future generations of citizens to repay foreign creditors is questionable. The problem is that this is the beginning of a string of crises and not the end. It’s time that a government practicing good governance vis-à-vis debt management is being put in place so as to safeguard a better tomorrow for future generation of Malaysia. Peruntukan Belanjawan Najib 2012 sebanyak RM232.8 bilion memperlihatkan peningkatan sebanyak 9 peratus berbanding dengan peruntukan pada tahun 2011. Daripada jumlah tersebut, 78 peratus atau RM181.6 bilion diperuntukkan untuk perbelanjaan mengurus dan 22 peratus atau RM51.2 bilion diperuntukkan untuk perbelanjaan pembangunan. Sementara itu, kutipan hasil Kerajaan Persekutuan bagi tahun 2012 dianggarkan meningkat 1.9 peratus kepada RM186.9 bilion dan defisit Kerajaan Persekutuan dijangka berkurangan kepada 4.7 peratus daripada KDNK atau RM45.9 bilion. Hal ini juga bermaksud, tahun 2012 merupakan tahun ke-15 Kerajaan Persekutuan mengalami defisit secara berterusan semenjak tahun 1998. Sumber: Laporan Ekonomi Kementerian Kewangan dan Laporan Bank Negara Malaysia. Jelas, tumpuan Belanjawan Najib 2012 ialah PRU Ke-13, bukan masalah ekonomi khususnya bagaimana negara berdepan dengan ekonomi dunia yang tidak menentu dan risiko defisit 15 tahun berturut-turut. Pakej Rangsangan Khas dengan jumlah projek bernilai RM6 bilion bukan sahaja tidak dibekalkan butiran, malah impaknya untuk merangsangkan ekonomi negara juga tidak menyakinkan. Ekonomi dunia memberi impak langsung ke atas ekonomi Malaysia. Dalam keadaan pertumbuhan ekonomi dunia lemah dan disemak semula kepada 4 peratus pada tahun 2012, unjuran pertumbuhan ekonomi negara sekitar 5 hingga 6 peratus bukan sahaja terlalu optimistik dan tidak menyakinkan, malah tidak bertanggungjawab. Pertimbangan PRU Ke-13 dan sifat short-sighted Belanjawan 2012 dilihat hanya mampu menjana pertumbuhan kurang daripada 4 peratus pada tahun 2012. Sesungguhnya, ramai penganalisa ekonomi berpendapat angka Kerajaan Persekutuan berhubung KDNK dan defisit adalah terlalu optimistik dan tidak menyakinkan. Apabila diimbas kembali rekod displin fiskal khususnya bagi tiga tahun yang lepad, Kerajaan Najib cenderung membentangkan sebuah Belanjawan Tahunan dengan kadar defisit yang lebih rendah, kemudian mengemukakan belanjawan tambahan pada masa depan yang bakal menyaksikan peningkatan perbelanjaan. Menurut Malaysian Rating Corp Bhd (MARC), Kerajaan BN dijangka mengumpul sebanyak RM88 bilion (berbanding RM58 bilion tahun lalu) melalui Sekuriti Kerajaan Malaysia (MGS) dan Terbitan Pelaburan Kerajaan (GII) bagi tujuan membiayai defisit belanjawan dan bon yang matang. MARC menjangkakan defisit belanjawan tahun 2011 berada pada paras RM45.5 bilion manakala MGS/GII yang matang pada tahun ini adalah bernilai RM45 bilion. Ini bermakna kerajaan mempunyai keperluan pembiayaan berjumlah RM90.5 bilion. Terbitan MGS telah mencecah RM66.5 bilion ataupun 74% daripada sasaran terbitan bagi tahun 2011. Menurut HSBC Global Research, dana asing berjumlah RM62 bilion telah dilabur di dalam pasaran MGS pada enam bulan pertama tahun 2011. Kini dengan pengumuman defisit sebanyak RM43.021 bilion bagi tahun 2012, isu pembiayaan sebenar yang bakal dihadapi Kerajaan Persekutuan menjadi persoalan penting. Sejauh mana perangkaan sebuah Belanjawan Negara yang tidak berhemat bakal meninggalkan tanggungan berat kepada generasi muda pada masa depan? Golongan berpendapatan menengah yang bukan pelabur atau peniaga besar tidak layak mendapat ‘handout’ RM500 kerana jumlah pendapatan isi rumah melebihi RM3,000 dan fakta bahawa biasanya lebih daripada seorang ahli keluarga perlu bekerja. Namun mereka juga berdepan dengan beban hidup yang berat. Golongan berpendapatan menengah yang juga merupakan pembayar cukai tidak mendapat sebarang bantuan bermakna untuk meringankan beban hidup. Kadar caruman KWSP sebanyak 11 peratus tidak diturunkan daripada 11 peratus kepada 8 peratus. Kadar cukai pendapatan individu juga tidak diturunkan. (sila lihat jadual di bawah) Ekoran itu, golongan ketua isi rumah berpendapatan menengah berdepan dengan tekanan inflasi dan kos sara hidup yang semakin meningkat sedangkan pendapatan boleh guna tidak bertambah. Dasar Transformasi Nasional (DTN) lebih merupakan kumpulan siri projek yang memperlihatkan peruntukan secara rampang dan ad hoc melalui Belanjawan Najib meskipun DTN mula berlangsung pada tahun 2011 sehinggalah 2020. Sesungguhnya, perancangan dasar negara bukan sahaja memerlukan pemahaman masalah, desakan dan tuntutan rakyat tetapi juga pendekatan dan penyelesaian masalah secara dasar. Dalam peruntukan RM1 bilion melalui Tabung Khas Pembinaan, Penambahbaikan dan Penyelenggaraan Sekolah khusus bagi keperluan mendesak untuk membaik-pulih bangunan sekolah, penyelenggaraan, pembelian peralatan dan pembinaan blok tambahan, meskipun demi tujuan meraih undi untuk PRU Ke-13, Najib terpaksa memberikan peruntukan kepada semua jenis sekolah tanpa mengira jenis aliran, tetapi peruntukan secara mendatar (egalitarian) tanpa mengira nisbah peruntukan terhadap bilangan sekolah bakal menimbulkan lebih banyak masalah daripada menyelesaikannya. Pengiraan peruntukan RM1 bilion tersebut berdasarkan nisbah apabila dibandingkan dengan peruntukan Belanjawan Najib tanpa mengira nisbah memberikan scenario keadilan social yang berbeza dan memperlihatkan perbezaan antara peruntukan secara dasar dengan peruntukan secara ad hoc. Pengagihan semula pendapatan negara apabila dilakukan secara dasar dapat menjamin pembangunan masyarakat secara menyeluruh. Contoh pengiraan di atas menunjukkan bahawa, sekolah kebangsaan sewajarnya diberikan peruntukan sebanyak RM758.54 juta dan bukannya RM500 juta. Peruntukan ad hoc dan dasar tidak adil BN selama ini telah mengakibatkan peruntukan yang cacat dilaksanakan demi meraih undi menjelang PRU Ke-13. Menyentuh pendidikan manusiawi, tidak cukup sekadar memansuhkan bayaran bayaran RM24.50 bagi sekolah rendah dan RM33.50 bagi sekolah menengah. Isu yang lebih penting ialah bagaimana beban bag murid sekolah yang berat dapat diberikan perhatian khusus dan isu penerbitan buku teks membabitkan kemelut antara Dewan Bahasa dan Pustaka (DBP) dan Dawama Sdn. Bhd. Harus diberikan penjelasan secara menyeluruh oleh kementerian dan agensi berkaitan kerana kemelut ini melibatkan persoalan dasar. Subsidi korporat kekal. Kerajaan Persekutuan nampaknya tidak berniat hendak menstruktur semula dasar subsidi supaya subsidi korporat dijuruskan ke arah pengukuhan jaringan keselamatan social berlandaskan ekonomi manusiawi dan bukannya ke arah pengukuhan politik naungan berlandaskan ekonomi kronisme. Berdasarkan laporan The Edge Financial Daily bertarikh 25 April 2011, keuntungan bersih Tenaga Nasional Berhad (TNB) susut 37% (RM630.3 million) pada 2QFY011, berbanding tahun lepas sebanyak RM1 bilion. Sesungguhnya, perangkaan Belanjawan Najib-BN membawa kepada suatu konsep penting apabila kita membicarakan penggubalan dan pelaksanaan dasar yang adil – konsep kebajikan. Belanjawan Najib-BN 2012 boleh dikatakan sebagai belanjawan satu kali (one-off), berdasarkan ’goodies’ kepada pelbagai lapisan masyarakat, daripada sekolah swasta, sekolah awam, pelbagai jenis sekolah rendah, keluarga yang mempunyai anak, wanita, sehingga pesara dan kakitangan awam. Najib berkata ini adalah konsep negara kebajikan. Nampaknya, beliau tidak tahu maksud sebenar negara kebajikan. Ia juga boleh dikatakan sebagai hiprokasi konsep negara kebajikan yang cuba dimanipulasikan oleh Kerajaan Najib-UMNO apabila berdepan dengan konsep negara berkebajikan PAS. Hakikatnya ialah, Malaysia masih jauh daripada memperlihatkan sebuah negara kebajikan/berkebajikan tetapi lebih mirip negara di bawah pemerintahan yang short-sighted dan hanya mementingkan kepentingan diri. Apakah dengan pembinaan prasarana, pemberian subsidi tertentu dan penyediaan projek oleh kerajaan, Najib cuba mengangkat Malaysia sebagai sebuah negara berkebajikan? Jika dilihat dari kaca mata PAS, pemahaman seumpama menzahirkan kecetekkan minda Kerajaan Najib-UMNO. Sedangkan maksud tersirat masih adalah konsep ’you help me, i help you’, yang dipopularkan oleh Najib semasa Pilihan Raya Kecil Sibu, Sarawak. Apa itu negara berkebajikan? Negara Berkebajikan didefinisikan sebagai; “Sebuah Negara yang mengutamakan kebajikan dan keselesaan rakyat sebagai agenda utama pembangunan negara”. Negara Berkebajikan mementingkan pembangunan, tetapi matlamatnya ialah kesejahteraan rakyat terbanyak. Konsep negara berkebajikan menjangkaui pemahaman biasa terhadap konsep kebajikan yang sekadar melihat kerajaan mempunyai tanggungjawab untuk memberi bantuan material kepada rakyatnya tanpa mempersoalkan ketidakadilan dan ketidaksaksamaan dari segi dasar serta aspek kerohaniannya. Negara Berkebajikan dikatakan sebagai lebih berteraskan sistem pemerintahan kerajaan Islam sewaktu zaman pemerintahan Nabi Yusuf sehingga ke pemerintahan Khalifah Umar bin Abdul Aziz. Negara Bekerbajikan bermakna kerajaan mambantu rakyat mencapai pembangunan insaniah yang sekata supaya semua golongan rakyat boleh mencapai pembangunan mengikut keperluan masing – masing. Negara berkebajikan mengambil peranan kerajaan adalah “guardian” atau Penjaga (ibu-bapa) kepada rakyat dan juga penting dalam melindungi dan memajukan ekonomi dan kesejahteraan sosial rakyat.” Ia adalah berdasarkan prinsip-prinsip kesamarataan peluang, pengagihan kekayaan yang saksama,dan tanggungjawab awam bagi orang-orang yang tidak dapat memanfaatkan peruntukan minimum untuk kehidupan yang baik. Istilah umum boleh meliputi pelbagai bentuk organisasi ekonomi dan sosial. Dalam konsep Negara Kebajikan yang dirangsangkan oleh PAS, adalah melalui sprite agama Islam, merangsangkan moral dan nilai keinsanan kepada masyarakat, dan juga kekayaan negara dikembalikan kepada rakyat dan bukan dikaut untuk memperkayakan pemimpin, ahli keluarga dan kroni mereka. Pebezaan signifikan antara Belanjawan Alternatif Pakatan Rakyat 2012 dan Belanjawan Kerajaan Najib-BN 2012 ialah perbezaan dari segi pendekatan yakni titik permulaan merangka belanjawan masing-masing. Titik permulaan bagi Pakatan Rakyat ialah reformasi dan pembaharuan pada peringkat dasar dan undang-undang sejajar dengan tuntutan zaman kini dan hukum negara, manakala titik permulaan bagi Barisan Nasional (BN) ialah peruntukan ad hoc tanpa perubahan dasar. Perdana Menteri Datuk Seri Najib Razak ketika menyampaikan perutusan khas sempena Hari Malaysia pada 15 Sept 2011 hanya mengumumkan pemansuhan permohonan permit penerbitan setiap tahun tetapi dikekalkan permohonan permit penerbitan dan kuasa mutlak Menteri menggantung atau memberhentikan permit sesebuah penerbitan. Pakatan Rakyat dalam Belanjawan Alternatif Pakatan 2012 menyatakan secara jelas pendirian untuk membubarkan sama sekali keperluan memohon lesen penerbitan dan digantikan dengan pendaftaran secara administratif. Begitu juga, Kerajaan BN telah mendominasi penubuhan Majlis Media dan cuba mengetepikan portal berita atas talian seperti Malaysiakini daripada penyertaan mereka dalam Majlis Media lantas berdepan dengan bantahan wartawan. Pakatan Rakyat dalam Belanjawan Alternatif Pakatan 2012 juga menyatakan secara jelas pendirian untuk membiarkan dunia kewartawanan yang mengendalikan penubuhan Majlis Media tanpa didominasi dengan kuasa Kerajaan Persekutuan. Maka bermulalah perbezaan secara dasar antara pentadbiran dan mentaliti Kerajaan BN berbanding dengan pimpinan ke depan dan harapan baharu yang dibawa oleh Pakatan Rakyat. Perbezaan seumpaman terserlah dalam pelbagai aspek hukum negara khususnya yang berkait rapat dengan Akta Keselamatan Dalam Negeri (ISA) dan undang-undang darurat. Najib yang terdesak untuk membuat pengumuman pemansuhan ISA terus menyatakan pendirian jelas Kerajaan BN bahawa dua akta baharu akan digubal berlandaskan semangat Artikel 14 Perlembagaan Persekutuan. Pakatan Rakyat secara jelas menyatakan bahawa pembaharuan institusi yang dibawa oleh Kerajaan Pakatan Rakyat kelak tidak akan meneruskan aspek perundangan yang bercanggah dengan hukum negara (rule of law) seperti tahanan tanpa bicara sama ada 60 hari atau 30 hari. Sejarah Malaysia menunjukkan secara jelas peruntukan seumpama sering disalah guna oleh sesetengah pemimpin negara atas bubi cara dan ketamakan kuasa individu (rule by law). Belanjawan 2012 Barisan Nasional (BN) dibintangi pemberian insentif berbentuk ‘handout’ seperti pemberian wang tunai, baucar, diskaun dan sebagainya, serta penyuntikan wang ke dalam macam-macam dana atau program yang canggih namanya. Contoh-contoh ‘handout’ yang dikatakan bersifat kebajikan dalam belanjawan BN 2012 termasuk pemberian RM500 kepada isirumah berpendapatan bulanan RM3,000 ke bawah secara ‘one-off’, bantuan kepada kanak-kanak miskin sebanyak RM100 sebulan dalam program KAR1SMA, dan diskaun 50 peratus tambang LRT dan monorel bagi warga emas. Belanjawan 2012 Pakatan Rakyat pula dicirikan oleh pelaksanaan dan hala tuju dasar yang mengutamakan keperluan (needs). Sebagai contoh, pelaksanaan dasar gaji minima RM1,100 merentas semua sektor adalah antara inisiatif yang paling menonjol dalam Belanjawan Pakatan Rakyat. Pemindaan Akta Persaingan dan penghapusan subsidi korporat juga merupakan tindakan-tindakan di peringkat dasar yang bertujuan menurunkan harga barangan dan perkhidmatan asas. Selain itu, pemberian RM1,000 secara ‘one-off’ kepada suri rumah yang layak, bayaran tambahan kepada isi rumah miskin tegar untuk memastikan pendapatan bulanan mencecah sekurang-kurangnya RM550, dan bayaran bonus warga emas sebanyak RM1,000 setahun kepada warga emas berpendapatan rendah merupakan beberapa langkah ‘handout’ yang dicadang. Pemberian wang tunai dan pinjaman wang sering dilihat sebagai penawar sakit jangka pendek yang tidak dapat menjamin kesejahteraan masa depan rakyat jikalau dasar dan undang-undang yang sedia ada tidak dapat membela nasib golongan pekerja dan golongan yang memerlukan. Inisiatif-inisiatif kebajikan yang terdapat di dalam Belanjawan 2012 Pakatan Rakyat lebih menekankan penghasilan kesan jangka panjang dan penciptaan suasana kebajikan yang berkekalan berlandaskan kesinambungan dasar yang dicadangkan dalam Agenda Ekonomi Malaysia dan Buku Jingga manakala tawaran-tawaran yang diberi dalam Belanjawan 2012 BN adalah umpama preskripsi penawar sakit yang memberi kelegaan jangka pendek. Gaji minima sebanyak RM1,100 dikuatkuasa serta merta. Elaun penjagaan anak sebanyak RM1,000 setahun kepada ibu-ibu yang layak. Pemberian RM1,000 secara one-off kepada suri rumah yang layak. Bayaran tambahan (top up payment) kepada isi rumah di dalam kategori miskin tegar untuk memastikan pendapatan bulanan mencecah sekurang-kurangnya RM550. Bayaran kepada penerima bantuan dari Jabatan Kebajikan Masyarakat akan diselaraskan kepada RM550 sebulan, dari kadar sedia ada sebanyak RM300 sebulan. Pemberian RM500 kepada isirumah berpendapatan bulanan RM3,000 ke bawah secara one-off. Bantuan kepada warga emas miskin sebanyak RM300 sebulan bagi 2012. Bantuan kepada kanak-kanak miskin sebanyak RM100 sebulan bagi 2012. Bayaran bonus warga emas sebanyak RM1,000 setahun kepada warga emas yang layak. Warga emas dikecualikan caj pendaftaran pesakit luar di semua hospital dan klinik kerajaan mulai 2012. Warga emas diberi diskaun 50% tambang LRT dan monorel. Kenaikkan gaji ekoran dasar gaji minima . Inisiatif Kecemerlangan Perkhidmatan Awam (CSEI) yang bertujuan menambah baik kepuasan kerja dan melaksanakan skim saraan, ganjaran dan kenaikan pangkat bagi pekerja yang cemerlang. Tambahan bonus setengah bulan gaji diberi pada Disember 2011 dengan bayaran minimum RM500 dan bayaran bantuan RM500 kepada pesara. Kenaikan Gaji Tahunan penjawat awam akan ditingkatkan antara RM80 hingga RM320 mengikut gred. 600,000 pesara kerajaan akan dapat kenaikan pencen pesara sebanyak 2% setahun. Umur persaraan wajib sektor awam dilanjutkan kepada 60 tahun daripada 58 tahun. Peruntukan subsidi bagi barangan aras sebanyak RM22 bilion. Peruntukan subsidi bagi barangan aras sebanyak RM33.2 bilion. Subsidi pertanian yang disalurkan terus kepada pengusaha kecil. Elaun kepada orang kurang upaya (OKU) dari RM150 hingga RM300 sebulan bagi 2012.
i) Menurut Laporan Ekonomi 2011/2012 Kementerian Kewangan Malaysia, Permodalan Nasional Berhad (PNB) sedang menyiapkan reka bentuk projek Warisan Merdeka. Projek bernilai RM5 bilion ini akan bermula tahun depan meskipun terdapat bantahan kuat. ii) Projek KLIFD bernilai RM26 bilion, projek pembangunan lima wilayah koridor bernilai hampir RM1 bilion (RM978 juta), dan projek Rolling Plan Kedua Rancangan Malaysia Ke-10 bernilai RM98.4 bilion. Projek-projek yang terlibat termasuk, pembinaan lebuh raya persisiran pantai Johor Bahru-Nusa Jaya, projek pelancongan warisan Taiping, projek landasan kereta api berkembar Gemas – Johor Bahru, projek Lebuhraya Pantai Timur Jabor – Kuala Terengganu, Lebuh Raya Pantai Barat Banting – Taiping, Lebuhraya Segamat – Tangkak, Lebuhraya Central Spine, pembinaan jalan Kota Marudu – Ranau, dan pembangunan semula Pangkalan Udara Sungai Besi. iii) Projek mega telah ‘ditransformasikan’ daripada projek infrastruktur di kawasan bandar yang amat menarik perhatian kepada projek infrastruktur di kawasan luar bandar yang tidak begitu menonjol. Antaranya, satu Pakej Rangsangan Khas RM6 bilion yang dibiayai melalui Privat Financing Initiative (PFI) diwujud bagi pembaikan dan penyelenggaraan sekolah, menaik taraf hospital, rancangan tebatan banjir, menaik taraf infrastruktur khas luar bandar, dan pembinaan perumahan rakyat. Peruntukan RM5 bilion juga disediakan bagi pembangunan infrastruktur asas luar bandar. Satu Program Lonjakan Mega Luar Bandar juga akan dilaksanakan dengan peruntukan RM110 juta. Selain itu, pembangunan semula Pulau Langkawi yang melibatkan peruntukan RM 420 juta ringgit juga boleh dikatakan sebagai projek mega. Seperti mana yang disebut sebelum ini, Belanjawan 2012 BN adalah penuh dengan pemberian ‘handout’, terutamanya kepada golongan berpendapatan rendah, tetapi seperti apa yang telah dibangkitkan, inisiatif sebegini hanya memberi kesan jangka pendek. Selain penawar sakit, satu lagi analogi bagi inisiatif sebegini adalah gula-gula yang berperisa manis dan menyenorokkan tetapi dihabiskan dengan cepat. Pemberian gula-gula memang akan dialu-alukan, tetapi persoalannya, bukan haruskah mereka menerima lebih banyak daripada setakat gula-gula sahaja, sedangkan syarikat-syarikat besar dan pelabur-pelabur yang kaya modal diberi mesin gula-gula? Para pelabur diberi insentif dari segi pengecualian cukai dan duti setem selama sekurang-kurangnya beberapa tahun. Sebagai contoh, pemaju hartanah di KLIFD akan menikmati pengecualian cukai pendapatan sebanyak 70 peratus selama lima tahun, pengusaha francais akan menikmati potongan cukai ke atas fi francais, dan pengusaha hotel baru empat dan lima bintang (hotel mewah) akan diberi pengecualian cukai pendapatan sebanyak 70 peratus serta elaun cukai pelaburan sebanyak 60 peratus bagi tempoh lima tahun. Selain itu, syarikat-syarikat besar seperti pengeluar tenaga bebas (IPP) diberi subsidi bernilai berjuta-juta sehingga berbilion-bilion ringgit . Perbezaan antara insentif yang diberi kepada golongan berpendapatan rendah dan insentif yang diberi kepada golongan pelabur dan pengusaha adalah, insentif bagi pelabur dan pengusaha adalah lebih sistemik kerana ia melibatkan sistem cukai yang memang akan wujud selalu. Syarikat-syarikat besar, para pelabur dan pengusaha kaya modal ini umpamanya diberi mesin gula-gula yang membolehkan mereka menghasilkan gula-gula sendiri berkali-kali, manakala golongan miskin diberi beberapa biji gula-gula untuk sekali sahaja. Golongan yang kaya modal diperkasakan tetapi golongan miskin hanya setakat ditenangkan. Justeru, Belanjawan 2012 BN kayakan lagi orang yang kaya raya dan sebenarnya melemahkan orang yang miskin. Laman Web Kementerian Pelajaran, < Perangkaan Pendidikan Malaysia 2010 > membekalkan statistic pelbagai jenis sekolah rendah tetapi tidak merangkumi Sekolah Mubaligh dan Maktab Rendah Sains MARA. KPRU Andaikan Pendidikan Khas merangkumi kedua-dua Sekolah Mubaligh dan Maktab Rendah Sains MARA sekadar untuk tujuan pengiraan. 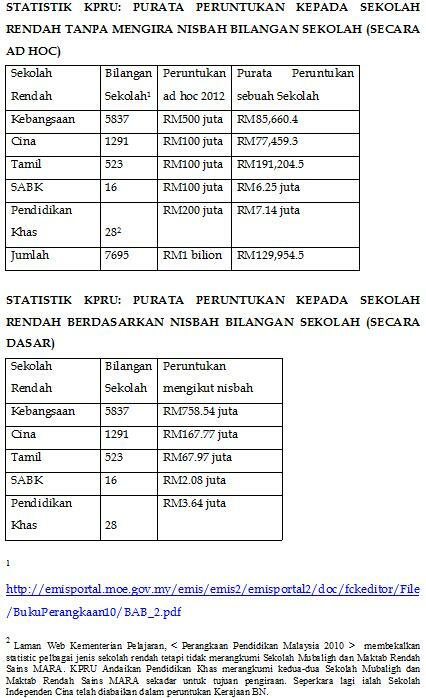 Seperkara lagi ialah Sekolah Independen Cina telah diabaikan dalam peruntukan Kerajaan BN. 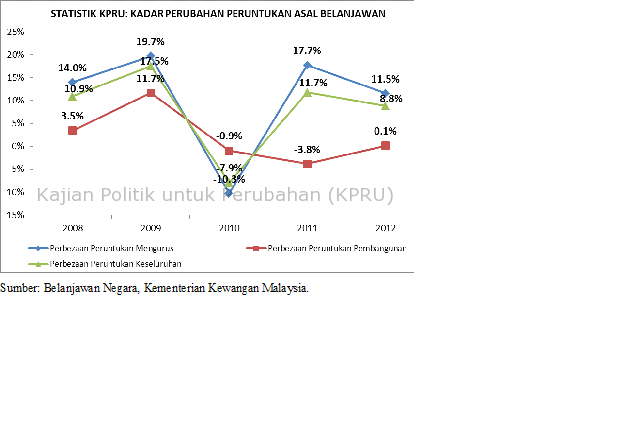 Analisis awalan Belanjawan 2012 ditulis khas untuk MerdekaReview atas permintaan.